Turn right onto Tottenham Court Road and walk 30m, where you will see Goodge Street. 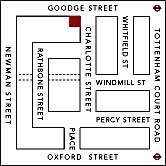 Turn right down Goodge Street and you will see us on the corner of Goodge Street and Charlotte Street. It's so easy, you have no excuse not to pop in for a drink or two!